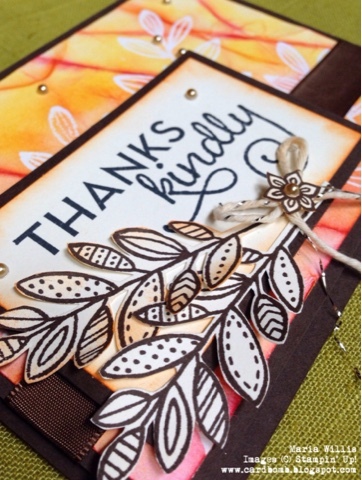 Welcome to the Stampin Friends Everything Fall Blog Hop! If you have just arrived from the uber talented Raquelle Clifton's blog, thank you for continuing with the hop! If you're starting the hop right here on my blog then HELLO! I'm so glad to have you and don't forget to check out all of the incredible projects on this hop. You can go backwards by hitting the "Previous" button above, or, forwards by hitting the "Next" button at the end of my post. Either way you decide to go you're about to see some amazing creations as each of us has designed both a card and project to share this month! This month the Stampin Friends Blog Hop is featuring three Awesome Guest Hoppers that you should definitely check out... recognize any of the names? EEEEEeee! That's right, I'm number three on the list! Thanks for having me Stampin Friends!! Maria Willis: That's me! You are here! Here's my Everything Fall Card. When I think of Fall I think of leaves and trees and bright, happy colors! I used Stampin' Ups! 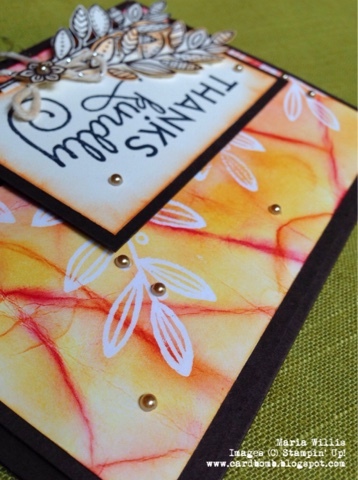 new Lighthearted Leaves stamp set and some pretty background colors to make this card. Here's a close up of my background... Yup! It started out as a mistake! I was sponging my colors onto the background piece when I accidentally bent my paper-Bummer! I noticed that the crease picked up more ink than the smooth part of the paper. So, I decided to crush the whole background paper up to get lots of creases in it. I smoothed it out as much as I could and sponged the rest of the background making sure to hit the creases. It ended up making a cool Batik looking background that I liked. Have you ever made a mistake and then turned it into something you liked? If you have, I'd love to hear about it! Please tell me your story in the comments below. I finished my card off by adding ribbon and a second layer. I fussy cut some leaves and a flower to make a bouquet of sorts and added some pearls. I kept the inside of the card simple by stamping in the same color as my card base (Early Espresso). 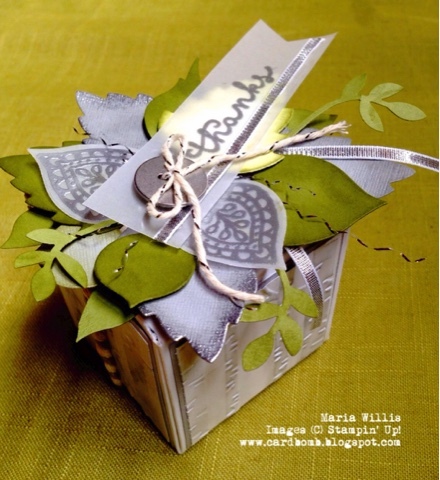 For my Everything Fall Project I made a gift box using the Stampin' Up! Gift Box Punch Board. If you don't have this board I can tell you that I love it! The entire box is just one piece! There is no cutting, gluing, adhering-no hoping it will fit together...none of that. 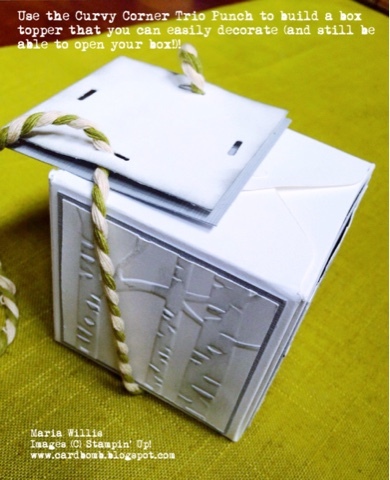 It's a one piece box that is easy to make and clasps together at the top (Yes! It clasps and the board takes care of that detail too!). Here is my box in a combination of Whisper White, Smoky Slate and Old Olive with a little silver detail. So, what does one put in a pretty little box like this? Well, I custom made my box to fit this gift that I will be giving to someone special. 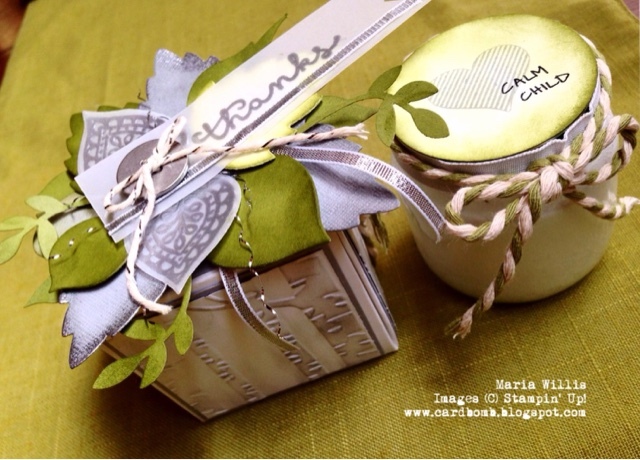 It's a jar of Calm Child Salve that I purchased from a business called WellPath. WellPath healing salves are on my list of favorite gifts to give (Organic, GMO-Free AND affordable!) and I'm really happy that I can design my own boxes for them. I also dressed up the salve jar to make it match my Fall Themed Box. One of the biggest problems (actually the only problem I think) that I run into when I am flamboyantly decorating boxes like these, or, the Curvy Keepsake Box is that I have to make sure I decorate in such a way that the box can still be opened without destroying my hard work. I really wanted to decorate the top of this box, but as I've explained, the top closes by clasping to itself. This means that I have to be very careful if I adhere anything at all to the top. Guess What?! I'm so excited to say that I have found a fantastic way to work around this dilemma! I used the new Curvy Corner Trio Punch to punch slits for my twine to pass through in a two layer box topper. Then I decorated the box topper the way you see in the pictures above. To remove the top you can either untie the twine or just slide the top and twine off like you would a belly band. I hope you enjoyed my projects! Please click next to continue the hop and see what the fabulous Kim Smith has made! I love to have feedback on my projects so if you have a minute please leave me a comment and let me know what you think. If you have any questions or are looking for a Stampin' Up! demonstrator please feel free to contact me. I would love to work with you. Maria, both your card and project were fabulous! Lighthearted Leaves are my new favorites leaves and I love how you've used them here! Gorgeous projects. Love what you did. 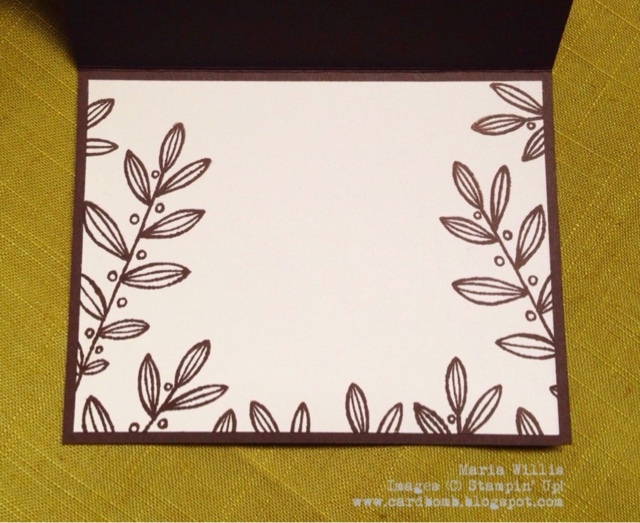 Maria, your oops on your card turned into WOW!!! :) Love both your card and box!!! LOVE your OOPS! background technique - TFS! Wow, incredible projects; just beautiful! Love that removable lid idea from the box, also. TFS! I knew you were going to knock it out the box!! Awesomesauce!! Love these projects! wow! your card is just stunning! I love the background, and OMG! what an amazing box and jar top. Very classy! Love your card and box. The receipient will be very happy I am sure. Mistake, what mistake? Both are gorgeous! Love how you turned a mistake into a masterpiece! I made a mistake this week when a clear stamp fell off the block onto the page. It fell and the sentiment was blurry but then I added another sentiment and made that one blurry as well, so it looked like it was supposed to be that way and I think it turned out visually interesting! Maria this is so cool!....before I read the article, I saw the picture and said "what a cool background technique...I need to find out how she did it"......little did I know how the background came to be---Perfect!! !...Thanks for sharing the details and I love both your projects! I know that feeling of sponging and the bend that happens, but I never thought to do this! Thank you for saving my cardstock from future mishaps :D I no longer have to throw it away or cut it down! Thanks for hopping with us!